Adding the right supplements to an individual’s diet can greatly increase their overall health. Since certain vitamins are not obtained as easily as others through diet alone, it’s a good idea to look into supplements as a way to provide the body with the nutrients it essentially needs. When considering which vitamins to supplement Vitamin B6 often tops the list due to its vast array of benefits. Although the vitamin is often sold in its inactive form it can also be purchased as an active co-enzyme that’s known as Pyridoxal 5-Phosphate. Vitamin B6 is an essential vitamin that’s converted into it’s active form, known as Pyridoxal 5-Phosphate or P5P in short, by the liver. The vitamin plays a crucial role in the human body since it’s responsible for many tasks including energy production and amino acid metabolism. For certain individuals the liver struggles to properly break down the vitamin, when taken in it’s inactive form, rendering the supplement useless when not properly absorbed. Because of this, many individuals should consider switching to the active form of the vitamin instead in order to obtain the best possible health benefits. Pyridoxal 5-Phosphate has been proven to be up to ten times more effective than it’s inactive form,Vitamin B6, making it an overall superior supplement. How Does P5P Benefit An Individual? 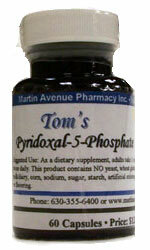 Since Pyridoxal 5-Phosphate is easily absorbed by the body it begins to work almost immediately once ingested. The co-enzyme is responsible for the formation of collagen which supports healthy skin, nail, and hair growth. It’s also crucial for the biosynthesis of neurotransmitters and plays an important role in the creation of Serotonin. Serotonin is an important neurotransmitter that’s responsible for curbing off depression and balancing out an individual’s mood. When taken as a daily supplement, P5P also enhances glucocorticoid action, which has natural anti-inflammatory potential, thus boosting the immune system to thwart of illness. The co-enzyme aids in digestion by breaking down fats, proteins, and carbohydrates so that they can be easily digested and also encourages the creation of red blood cells. Many other benefits are also associated with P5P including both heme biosynthesis and amino acid metabolism. These important processes are essential and help to maintain an individual’s overall health. How Does A Vitamin B6 Deficiency Affect Humans? Individuals often suffer from a wide range of troubling symptoms before discovering that a Vitamin B6 deficiency may be the cause. These symptoms include depression, irritability, unexplained fatigue, dermatitis, water retention, poor appetite, weakness, and much more. Since their symptoms may be vague, or widely varied, a Vitamin B6 deficiency can often go undiagnosed for extended periods of time. Why Should P5P Be Supplemented? By taking a daily Pyridoxal 5-Phosphate supplement individuals can enhance their overall health and improve their body’s natural functioning. Overtime, these benefits can be felt and seen which greatly helps to improve a person’s overall quality of life. Since P5P has the ability to increase energy, enhance the mood, reduce sickness and improve the immune system’s response it should be taken into serious consideration when choosing supplements to add to an individual’s diet.